The objective of Dig Dug is to eliminate underground-dwelling monsters by either inflating them with an air pump until they explode, or by dropping rocks on them. There are two kinds of enemies in the game: "Pookas" (a race of round red monsters, said to be modeled after tomatoes, that wear yellow goggles), and "Fygars" (a race of green dragons that can breathe fire while their wings flash). 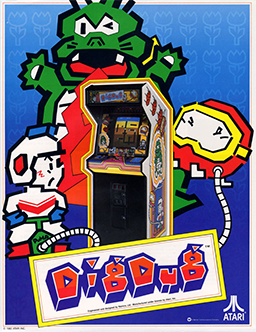 Dig Dug was rated the sixth most popular coin-operated video game of all time by the Killer List of Video Games website. In 1984 Softline readers named computer versions of Dig Dug the tenth-worst Apple and fourth-worst Atari program of 1983. It has been said that the music for the game show Starcade was inspired from the music for Dig Dug. In the Disney movie Wreck-It Ralph, Dig Dug, a Pooka, and a Fygar are three of the characters in Game Central Station. The Pooka and the Fygar are seen when the camera is moving from one of the tunnels, and Dig Dug starts trying to dig away from Ralph when he comes towards him.